The Ergomat Basic Plano is an anti-fatigue mat with a smooth surfaced that is best used for light-duty demands. This mat will perform perfectly in non-demanding environments such as retail counters, mail rooms or even pick-lines. If used in manufacturing, assembly or even other unsupported industrial work environments the warranty will become void. 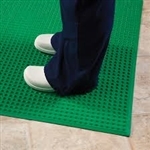 The Basic Bubble mat is molded in durable lightweight virgin polyurethane. This 2' x 3' light-duty ergonomic mat provides the best ergonomic support in non-abrasive environments. Best in non-demanding environments such as retail counters, mail rooms and pick-lines, the Ergomat Basic Smooth anti-fatigue mat is the perfect option. If used in other work environments such as manufacturing, assembly or other inappropriate and unsupported industrial uses the warranty protection will become void. 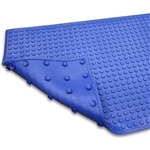 Ergomat AFS Complete Smooth, 2 ft. x 3 ft.
Made of pure polyurethane the Ergomat AFS Complete Smooth is designed to increase comfort while also reducing tripping hazards, body aches, quality issues and sick leaves. This mat is a perfect addition for areas that may contain sensitive equipment where static control is extremely crucial. The Ergomat Super-Safe Smooth is an anti-microbial mat designed for environments are exposed to liquids that can potentially create other mats to hydroplane. On the underside of the Super-Safe Ergo are suction cups which easily grab onto the floor, for added safety and traction. The premium rubber that the mat is made out of also withstand rigorous cleaning regimens. Made of pure Nitril rubber, the Ergomat Nitril Smooth is designed to increase comfort while also meeting the requirements of clean room class certification. This flat mat is perfect for many critical environments. Made of pure polyurethane the Ergomat AFS Complete Smooth ESD is designed to increase comfort while also reducing tripping hazards, body aches, quality issues and sick leaves. This mat is a feature rich ergonomic mat that can tolerate mild exposure to oils and other liquids while providing enhanced anti-static protection. Ergomat Infinity Ultra Smooth Plano is the only true anti-fatigue mat with a warranty up to 12 years given that it is only exposed to dry environments. This mat has the comfort of a polyurethane mat and the extra benefit of easy clean-ability due to it's non-porous (closed cell) surface. Ultimately this mat is absolutely the best for areas that need good chemical and UV resistance (except for organic solvents) or where users need to both sit and stand. The Ergomat Bubble Down's design is perfect to increase comfort for its user while also reducing tripping hazards, body aches and even quality issues. This mat is best if used in dry environments or where extreme amounts of pivoting occur. Ergomat Infinity Smooth is the only true anti-fatigue mat with a warranty up to 12 years given that it is only exposed to dry environments. This mat has the comfort of a polyurethane mat and the extra benefit of easy clean-ability due to it's non-porous (closed cell) surface. Ultimately this mat is absolutely the best for areas that need good chemical and UV resistance (except for organic solvents) or where users need to both sit and stand. The Ergomat Nitro is specifically designed to offer superior ergonomic and anti-slip properties in some of the toughest work environments. The Ergomat Nitro is resistant to many different types of oils, alkaline liquids, both acids and hot metal shavings (1112ºF/600ºC). With its unique design and peaked cone surface, the Nitro mat is perfect for many different work industries as well as other industry environments that require mats with anti-slip properties. Made of premium EPDM rubber, the Ergomat Hygiene is designed for simple and easy clean-ability. USDA Certified, Light Weight and easy to clean makes this mat a favorite in the medical and food industries. The Hygiene Mat is available in 4 colors for easy color coding. Ergomat Infinity Smooth ESD is the only true anti-fatigue mat with lifetime warranty (from exposure in dry environments only). This mat has the comfort of a polyurethane mat and the extra benefit of easy clean-ability due to it's non-porous (closed cell) surface. Ultimately this mat is absolutely the best for areas that need good chemical and UV resistance (except for organic solvents) or where users need to both sit and stand. If you're looking for the ultimate smooth ergonomic mat, the Ergomat Infinity Deluxe is the mat for you! Made of durable 5/8" thick polyurethane rubber, this mat is designed to provide ergonomic relief without hindering movement. This mat also includes a durable, non-porous closed cell surface that allows for moisture and chemical resistance as well as added clean-ability! Ergomat Infinity Bubble, 2 ft. x 3 ft.
Ergomat Infinity Bubble 2 ft. x 3 ft. Mat is the only true ergonomic mat with a warranty up to 12 years given that it is only exposed to dry environments. This polyurethane mat offers comfort and easy clean-ability due to it's non-porous surface. Ultimately the best for areas that need good chemical and UV resistance. Ergomat Super-Safe Ergo, 2 ft. x 3 ft. The Ergomat Super-Safe Ergo is an anti-microbial mat designed for environments that are exposed to liquids that can potentially create other mats to hydroplane. On the underside of the Super-Safe Ergo are suction cups which easily grab onto the floor, for added safety and traction. The premium rubber that the mat is made out of also withstand rigorous cleaning regimens. The Softline Mat is an ergonomic mat designed for areas where resistance to oil, acids, petrochemical and heat is a major requirement. This 2 ft. x 3 ft. mat is perfect for extreme areas. Color: Black Other sizes are available, call us now! The Softline Mat is an ergonomic mat designed for areas where resistance to oil, acids, petrochemical and heat is a major requirement. This 2 ft. x 3 ft. mat is perfect for extreme areas. Color: Gray Other sizes are available, call us now! The Softline Mat is an ergonomic mat designed for areas where resistance to oil, acids, petrochemical and heat is a major requirement. This 2 ft. x 3 ft. mat is perfect for extreme areas. Color: Blue Other sizes are available, call us now! Made of pure Nitril rubber, the Ergomat Nitril F is designed to increase comfort while also reducing tripping hazards, body aches, quality issues and sick leaves. This mat is perfect for being in work environments that will be exposed to heat and oil and where petrochemical resistance is crucial. Ergomat's Bubble Down pure polyurethane anti-fatigue mat is best used in dry areas or non-abrasive environments. It's contrasting Yellow Beveled Edge promotes safety as it indicates a change of level. Ergomat's Sticky Mat helps to provide fast, convenient and a dependable way to clean the user's shoe soles before entering a sanitary area. These mats also reduce traffic-bone contaminants and have been proven to be trustworthy and effective in a variety of industries. Such industry environments such as microelectronics, aerospace, pharmaceuticals and food processing areas, since the Sticky Mats are also disposable this makes it the best, most reliable way to keep any floors free of debris. If you're looking for the ultimate smooth ergonomic mat, the Ergomat Infinity Deluxe ESD is the mat for you! Made of durable 5/8" thick polyurethane rubber, this mat is designed to provide ergonomic relief without hindering movement. This mat also includes a durable, non-porous closed cell surface that allows for moisture and chemical resistance as well as added clean-ability! The mission of Ergomat has been to develop, manufacture and market superior products, which offer exceptional benefits to the employees as well as a long-term solution for the companies. Most of Ergomat’s products are developed in cooperation with major industrial players. They define their existing problems, and together work with Ergomat to develop the best possible solution. Ergomat offers superior products and solutions which not only can prevent, but also eliminate many of the safety and ergonomic problems faced in today‘s market and hereby lower worker’s compensation, sick leave and personal injuries while increasing moral, employee wellness and productivity. Ergomat is dedicating their time into researching new ways to help reduce or eliminate problems related to poor circulation, musculoskeletal troubles (MST) and prolonged standing health issues using only environmental responsible solutions. Ergonomic Solutions has offered the Ergomat solution with the Ergotron WorkFit Sit-Stand Workstations. Customers have been extremely pleased with this solution! Ergomat's goal is to only market products which have 100% recyclability or a durability which can justify being the best environmental solution available in the market place. They strive to promote environmentally safe solutions for plant marking and striping which through innovation has zero wastes, zero fumes and 100% recyclability. To eliminate health issues associated with standing for long periods of time as well as to market environmentally friendly solutions is Ergomat's goal, responsibility and philosophy.